Middle Atlantic's 4U Tilt-Out 20"D Wall Rack with Surface Mount (Putty) makes an optimal low-profile wall storage for engineering, security, or announcement equipment controls. 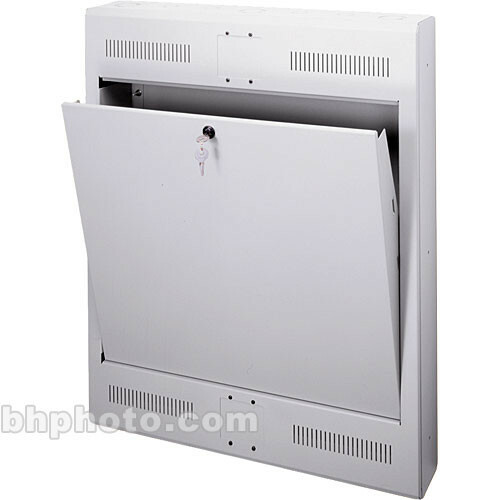 This lockable, inconspicuous cabinet offers a 7" (4U) racking height and a 20" maximum usable depth. A simple installation is all it takes and you're ready to tuck away any mid-size high-value security or operation devices, with ease. This model has a 20-Degree tilt-out operating position and a 105-Degree service opening position, and this rack includes a 4-space rackrail on the inner wall, which makes it easier to use with rackmount equipment. The outside structure measures approximately 25 x 30 x 8" (WxHxD). Utilizing 18-AWG gauge steel, the tilt rack has a 100 lbs weight capacity. It includes a 4 x 4" electrical box for high-voltage connections and an 8.5 x 8.5" knockout for cable pass through. It is finished in a putty varnish, and is UL listed in the US and Canada. This rack system gives electronic systems the pivotal treatment for which they were designed. Middle-Atlantic holds nothing back in convenience, utility, and ingenuity of design. The best device protection is right here. To have your key control devices at your fingertips, this low profile design is the ideal storage unit, and can be installed virtually anywhere you need it. Simply pull out this tilt-out rack to its 20-Degree service position for quick operation or pull it out to 105 Degrees for servicing. It's that easy, because it should be. This model comes with a tough lock that will keep your control equipment safe and secure. Box Dimensions (LxWxH) 34.0 x 29.0 x 13.0"